These Baked Pita Chips are so quick and easy, and perfect for hearty dips! I’ve been eating waaaaay too many of my favorite chips lately (<– affiliate link, which just made me realize you can get them for $1.40/bag!! ), with salsa of course, because salsa is healthy and has like zero calories and that means the chips do too, riiiight??? It’s time for a healthy swap that’s just begging for a protein packed hummus (recipe for <– THAT coming at you soon!). These baked pita chips are so incredibly easy, and I like to think healthy. Sometimes I make them torn apart at the pocket so they get extra thin and crispy, but you can keep it simple by just brushing a pita with olive oil, cutting it into wedges, sprinkling with salt, and baking away! Made as-is, these are only 3 ingredients and 15 minutes! 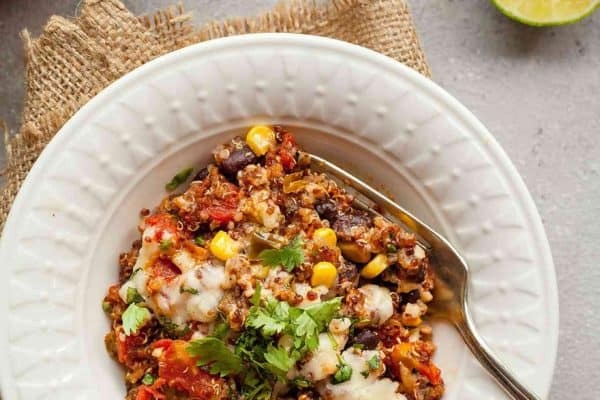 You’re going to want to make these all the time, and you totally can because it’s so easy! Baked Pita Chips are perfect for enjoying your favorite dip! Brush both sides of pita lightly with olive oil. 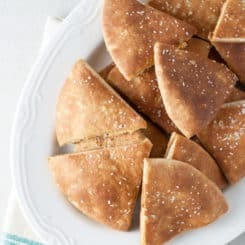 Cut pitas into triangles and arrange in a single layer on a baking sheet (or two, if necessary). Sprinkle with salt. Bake pitas 12-15 minutes or until they are crisp and beginning to brown. Let rest a few minutes before enjoying.